Leave behind the glitter and glue dots. Creativity in the classroom is less about art projects and more about helping students develop creative thinking skills. 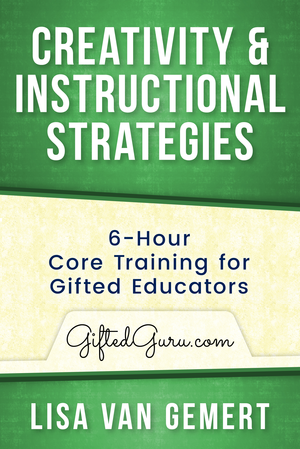 In this six-hour course, “Creativity and Instructional Strategies,” Lisa Van Gemert guides teachers through an in-depth look at how to bring creative instruction into their classrooms. Discover resources, inspiration, and knowledge that will make educators excited about teaching with creativity. Incorporating creativity into the classroom isn’t just about making art projects or decorations. It’s about teaching students to approach problems creatively and become richer, deeper thinkers. Lisa Van Gemert, award-winning educational consultant, guides teachers through an in-depth look at how to bring creative instruction into their classrooms. This six-hour course, “Creativity and Instructional Strategies,” dives deep into what creativity is and how to use it in the classroom. Ms. Van Gemert uses data and research to explain the educational and personal benefits that students gain when they learn to think creatively. She addresses common myths about creativity, such as that it’s only useful for lower elementary grades or for certain subjects. After taking this course educators will have the resources, inspiration, and knowledge they need to make their classrooms engaging and exciting through creativity.